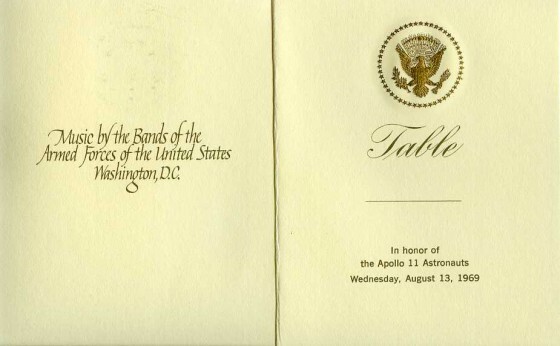 Apollo 11 State Dinner from Richard Nixon Foundation on Vimeo. 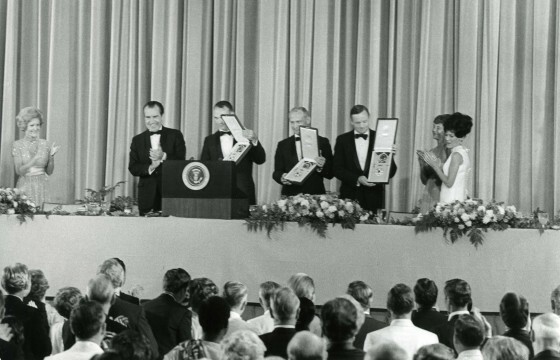 President Nixon and the astronauts of Apollo 11. 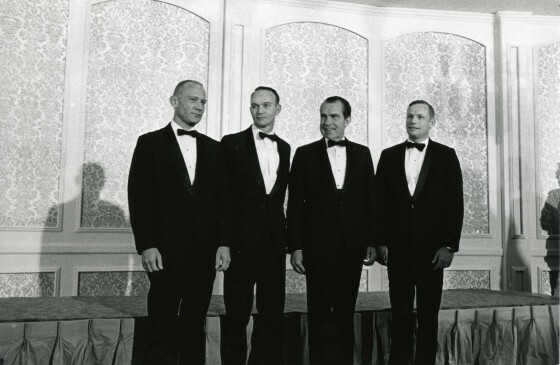 From left to right: Buzz Aldrin, Michael Collins, President Nixon, and Neil Armstrong. On August 13, 1969, the crew of Apollo 11 kicked off a 45-day “Great Leap” celebratory tour that brought them to 25 foreign countries. With each country visited, they were treated to a heroes welcome. But before the Apollo 11 astronauts made their great leap around the world, they celebrated in the United States, riding in parades attended by hundreds of thousands of admirers in New York, Chicago, and finally, Los Angeles. 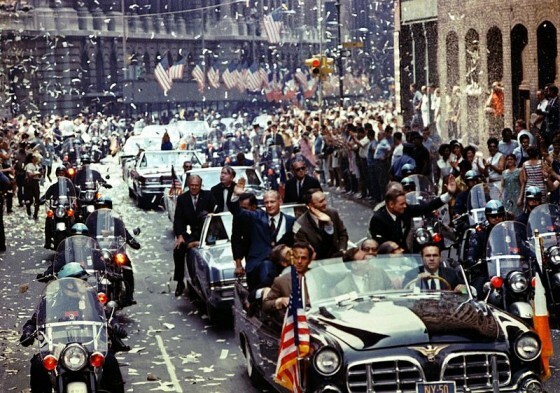 On August 13, 1969, the Apollo 11 astronauts were treated to ticker tape parades in New York, Chicago, and Los Angeles. 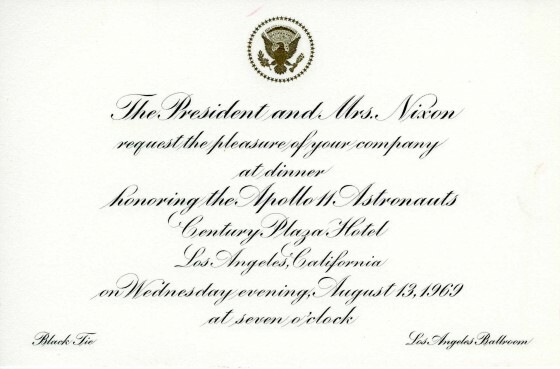 On the evening of the same day, President and Mrs. Nixon hosted a huge state dinner at the Century Plaza Hotel in Los Angeles to honor the Apollo 11 astronauts on their safe return to Earth. Over 50 members of Congress, representatives from 83 foreign nations and 14 members of the President’s Cabinet attended the star-studded gala, often recognized as one of the greatest – if not the greatest – state dinners held outside of Washington. One thousand four hundred and forty people attended this glamorous occasion, including the astronaut’s families, space and aviation pioneers, space-related committees, and the greatest stars of Hollywood. All in one room, one could find Mrs. Walt Disney, Ed and Don Nixon, Justice Warren Burger, Buddy Rodgers, and the widows of the Astronauts of Apollo 1. Jacqueline Kennedy Onassis, Lyndon B. Johnson, Fred Astaire, Howard Hughes, and others were invited but sent their regrets. I want to say very simply to our three astronauts, we thank you for your courage. We thank you for raising our sights, the sights of men and women throughout the world to a new dimension–the sky is no longer the limit. And we thank you, too, for the men that you are, you and all of your colleagues, what fine men, what fine examples to young America and young people all over the world. 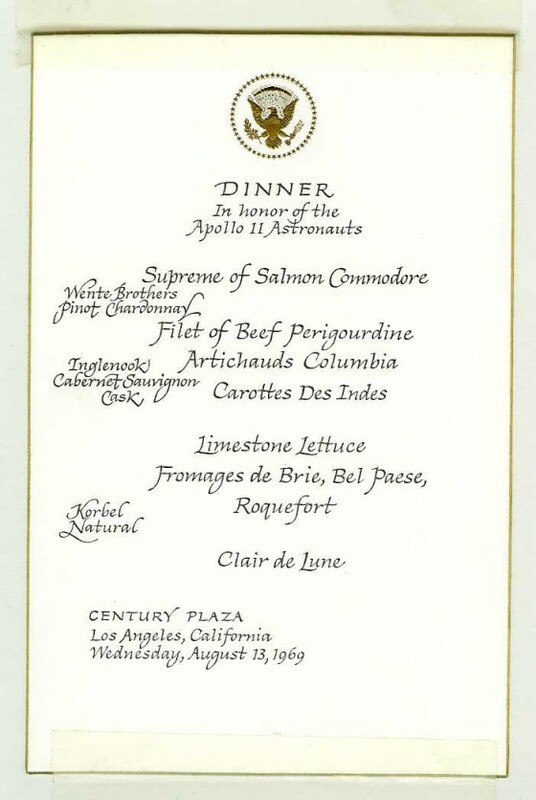 It has been my privilege in the White House, and also in other world capitals, to propose toasts to many distinguished people, to emperors, to kings, to presidents, to prime ministers, and, yes, to a duke; and tonight, this is the highest privilege I could have, to propose a toast to America’s astronauts. 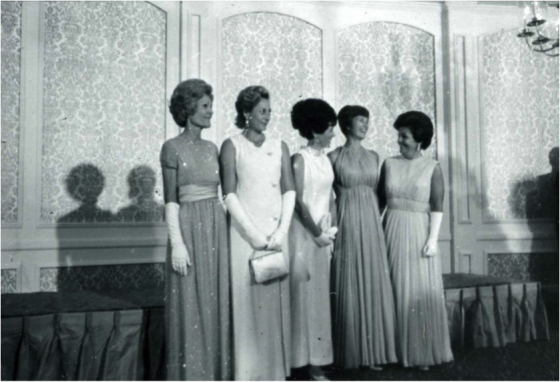 First Lady Pat Nixon with the astronauts’ wives. 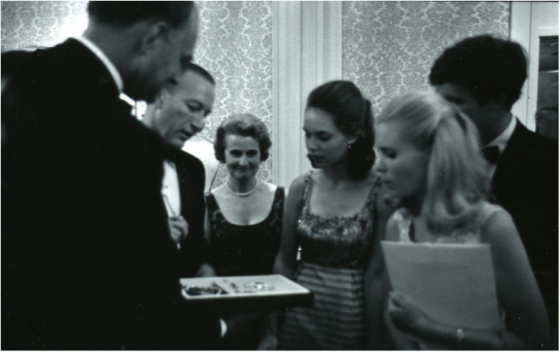 Julie and Tricia Nixon admire the astronauts’ awards.